I love setting goals and planning for the New Year. It’s fun for me to take the time to dream and play with what’s possible. And yet, I used to struggle with follow up and actual achievement of my goals. As a busy entrepreneur with a quickly growing business, I knew I needed some goal setting strategies that would help me go from the happy la-la land of dreams to happy achievement of my goals. This was not a helpful attitude for me if I wanted to grow my business. I have learned many lessons in my life as a creative entrepreneur but one of the most important was that my mindset has more to do with my success than all the practical tools or strategies I know how to do. 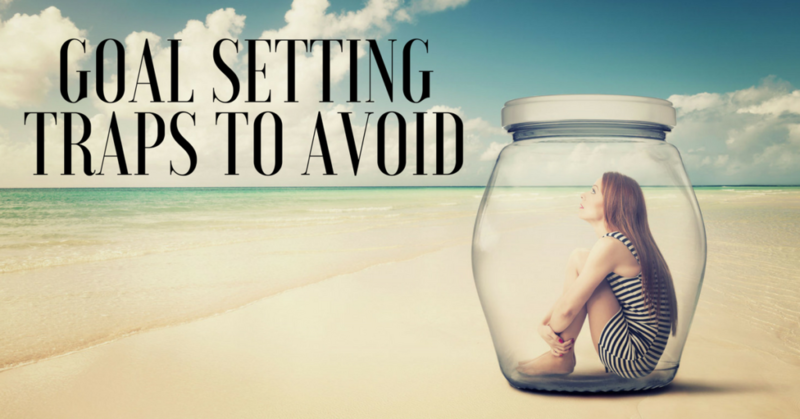 I discovered four very common “goal setting traps” that you may be falling into. These are dangerous mistakes that can make it very difficult for you to accomplish whatever you’re setting out to achieve. 1. Your goals are too vague. If your goals contain uncertainties, you’ll have difficulty attaining them. Strive to create specific goals. Determine exactly what you want to achieve and attach terms to your goals that are certain and measurable. Ensure that your goals are measurable and timely. There should be a specific point when you can tell that you’ve achieved your goal. “Get new clients” is not measurable, but “Get 10 new clients“ is. “Get 10 new clients in 90 days” is ideal, because it’s clear, concise, measurable, and has a motivation-driving deadline. 2. Your goals aren’t personal enough. Yes, I know we are talking about business! But business is personal. And in today’s marketplace you have thousands of experts trying to tell you what you should do in order to grow. You’re much more likely to reach your goals if they’re your own goals, speaking to your own desires, rather than being inspired by others. While you can model your goals on the achievements of others, they should be goals that are meaningful to you in order to drive your success. For example, Facebook Live is a great way to grow your business and get clients but maybe your clients aren’t on Facebook or the technology feels overwhelming. There are many ways to get clients, choose the way that feels most aligned for you personally. 3. Your goals are more difficult than you realized. (This is my biggest personal goal-setting trap!) Setting goals that are beyond your reach is simply inviting failure. Instead, set goals that you know are attainable, and break them into smaller, bite-sized stepping stones to enhance your ability for achievement. In Episode 76 of The Path to Profit Podcast we share why setting mini-goals will help you make 2018 your best year ever! You can listen here: Make 2018 Your Most Spectacular Year Ever. Follow the SMART strategy for goal setting. Create goals that are Specific, Measurable, Attainable, Realistic and Timely in order to make it easier for you to achieve them. Your goals don’t have to be far off or hard to reach – you can simply set new goals to replace the old as you reach each smaller goal. Download our FREE Smart Goals Printable here. This simple process has been around forever and it works like a charm! My wonderful daughter Maggie created this awesome printable for you. Goals that are too easy can also be detrimental. If you don’t feel motivated or challenged, you may not perceive that the goal is worth your time or effort. Choose goals and aspirations that drive you to achieve them. 4. You’re keeping your goals a secret. If you keep your goals hidden, you’re more likely to abandon them. Tell everyone you can about your goals and put them out there in the public eye so others can help motivate you to achieve what matters to you most. I know this is hard to do so make sure you tell people who will support you unconditionally or challenge you in a positive way. Develop a support team of like-minded individuals to get the help and support you need. When you share your goals with others, they can build you up and help you find the drive that you need to fulfill all that you set out to do. Feel free to come on over and share your goals in our Mentors, Makers & Mavericks Facebook group. We’d be delighted to support you. I will model how to do this by sharing one of my most important goals for 2018. My intention is to start an online store in 2018 for selling my artwork. This is scary for me. I feel like it’s a stretch beyond sharing my art on social media and having people say it’s pretty or they like it. Now I am saying “Will you pay me for it?” I am sure many of you have experienced this same fear and hesitation, right? I could set the intention, I could keep talking about it, and in fact I have been saying all year to people who ask me when they can buy my art, “I don’t need another business… or Yeah, yeah, I will get there…” I’ve made excuses and stayed busy doing other things. So here is my realistic goal (it’s also easy for me to try to make things happen too fast and make myself and my husband crazy): I will have set up an online store for selling my art on my MinetteRiordan.com website by February 1, 2018. Ack – now it’s real and it’s very personal. I have shared publicly that I am committed to making this happen. My next step is to break this bigger goal down into mini-steps so it doesn’t feel so daunting! 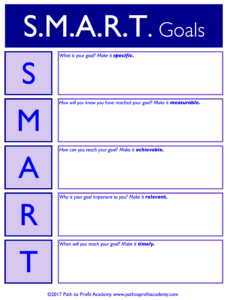 I will be using the SMART goals template today. Will you? Although these are simple pitfalls, they can have an enormous impact on your ability to achieve what you want. When you avoid these four common traps to effective goal-setting, not only does it make it easier for you to attain your goals, but it also helps you overcome challenges along the way. That’s amazing Minette! My big goal for 2018 (biggest goal for a number of years now actually!) is to set up a website to sell my art online!! Yikes! So I totally get that you feel it is scary. Anyway, I thought by writing this comment I too am making it public! Good luck with your venture and can’t wait to see your website. I am sure it will be brilliant! PS.Can’t put in my website details below but will be able to do that in 2018! Yeah for you, Suzy!! Let’s do it!